Today I am sharing a work look with you! This dress from the Sweetest Stitch is the perfect little shift dress! 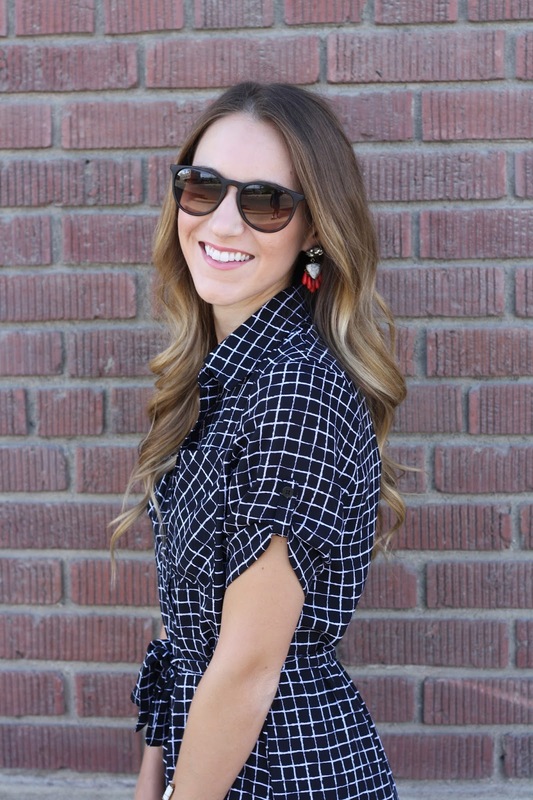 I love the checkered print and that it is button down with a tie at the waist! I wore it to work recently with some comfortable flats and bright earrings to add a pop of color. The thing I love most about this dress is how easily it transitions from the classroom to the weekend, which I will show you later this week! So cool you wore a dress to class! I always am afraid I'll feel out of place! Love it! This dress is such a perfect work dress, without being boring or "too serious". Love it with the Tory flats, super cute look! Such a cute dress! Love your flats too. I love the earrings you paired with this dress! Adorable! Cool dress!! I love love your earrings and shoes! What a cute shirtdress! Comfy casual for class is my fav! Also, I like have to use a backpack because of how much crap I have. I'm like a freshman in high school! You are rocking that dress! love how you paired the fun earrings with it too! The cut and pattern and everything are perfection! It looks great on you! This is so adorable! Something that I could totally see myself wearing! Love the styling of this as well 🙂 Great job! Oh my gosh, this outfit is way too cute! You look fabulous, as usual. Sweetest Stitch has the best stuff! This dress is SO adorable, I'm a sucker for a good black and white dress! This is such a flattering dress! It suits you so well! I love your dress! It's so flattering! I LOVE your dress! It makes me so happy when I see bloggers pick up pieces that I can wear to work 🙂 You look so cute, as always! That dress is so cute, I really like how you styled it with those flats! Simple jewelry really lets the dress speak for itself! I'm OBSESSED with this shirtdress on you. Gorgeous. Love that checkered dress. I totally need that in my teacher wardrobe!